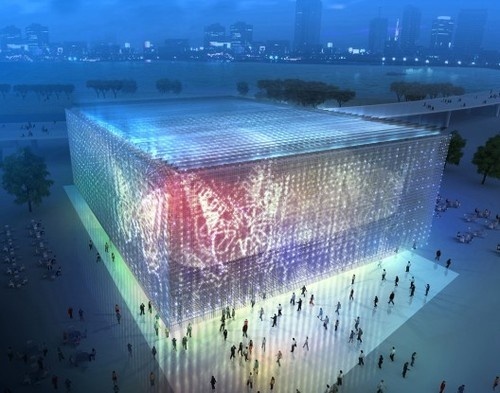 Concepts like this Shanghai Corporate Pavilion is made up entirely of recycled CD cases. The Shanghai Corporate Pavilion features a 1600m2 solar heat-collecting tube on the roof. These solar tube can collect solar energy to produce hot water up to 95°C. Ultra-low temperature power generation techology, a novel way to generate electricity through solar power. The power generated using this technology can be used for both the exposition and for every day. Shanghai produces nearly 30 million of waste CDs every year, and only 25% of them are reclaimed and recycled. If these CDs were reclaimed and washed, they could be used to produce polycarbonate granules and manufacture more polycarbonate plastic products. The external facade materials of the Shanghai Corporate Pavilion will use polycarbonate transparent plastic tubes to create its dreamlike appearance. After the Expo, also plastic tubes can be easily recycled to reduce social wastage. For the Shanghai Corporate pavilion, rainwater will be collected and recycled. After such treatment as sedimentation, filtration and storage, rainwater can be used for daily purposes at the pavilion and for the "mist" in particular. The mist can lower the temperature, purify the air and create a comfortable climate in pavilion. The spray can also be used to form various patterns under ceiling of entrance hall and make the overall appearance of the Shanghai Corporate Pavilion fresh and elegant.